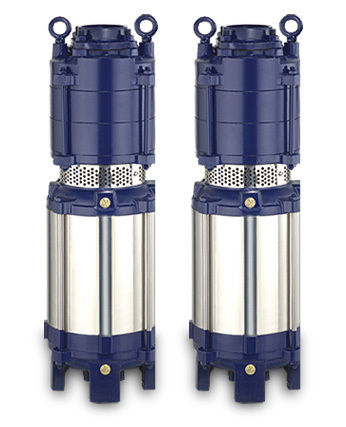 F-Tech Engineering is leading Horizontal/Vertical Openwell submersible pump manufacturers in India. No suction problem: Pumpset works under water and hence suction problems do not arise. No water level guard required: Due to horizontal construction, the pumpset will always remain submerged in water and therefore the pumps will never run dry, which is unique feature available only in this pumpset. Hence no water level guard is required. Easy to install: Pumpset rest at the bottom of openwell and installation does not require foundation and pump house. Pumping from sumps for high rise buildings and industry. Openwell pumping for agriculture & irrigation. Compatible with low friction flexible hose pipes. Optional bronze impeller on request. Rigid cast iron impeller and volute casing provide good efficiency and long life. Single and three phase water-filled submersible induction motor. Heavy duty stainless steel motor body. Heavy duty water-lubricated bearing for long trouble free operation. Suitable for single phase 160-240 Vold and three phase 340-440 Vold, 50 Hz power supplies. All F-Tech Engineering products carries a 12 months manufacturing defects warranty from the date of purchase. Discharge at Duty Point 250 to 800 LPM .